If you want to develop a certain skill, then you need to practice. That’s a rule that applies to just about everything. Unfortunately, that’s not always practical when it comes to practicing your hitting for baseball games. Local ballparks are always busy, and not everyone has a backyard that can offer the needed space. The balls can be dangerous too, as they can hit windows and cars and even other people (like the pitcher). Fortunately, you can make things easier and safer for everyone because there are home batting cages available for you to use. By using an at home batting cage, you can improve your hitting in a way that’s safer and more convenient for you. The netting keeps the balls from wayward directions that can smash windows and cars. The cage comes with a screen that can also protect pitchers. You won’t have to go far getting the baseballs after each pitch. Monitor your swing with the Zepp baseball swing analyzer and make improvements in the cage. First of all, you may want to make sure that you actually have the space to accommodate the batting cages at home. These things often advertise their dimensions so at least you get an idea whether or not you have the space in your backyard. Very rarely do people have the space to put this indoors. Then you better make sure you have the budget for this. The price often comes in at around the $300 to $600 price range. But some are even more expensive at more than $1,000 while the cheapest may come in at about $150. Here are some parts you need to look over when you’re trying to decide among the various home batting cages for sale you see online. This is one of the most crucial (if not the most important) part of batting cages for home use. The frame provides the support system and structure, so you need to make sure that the craftsmanship is up to scratch by reading customer reviews. Then you also need to check the materials. Usually, the frame is made from metal, although others use fiberglass. The frame may sometimes not come with the needed poles, because they can be very expensive to ship due to their size. So that means you may still need to buy them at your local hardware store. But the kits should come with the connecters needed to attach poles to one another. You need to first check that these things have a certain give. That’s so the balls don’t ricochet off the frame and hit someone. It should also have some protection from the elements. It should be resistant to rust and also be protected from UV rays. With UV protection, the constant exposure to sunlight can cause the frame to deteriorate much more quickly. Galvanized steel is among the most popular materials that satisfy these requirements. The nets are usually attached to the frame of the home batting cages. They’re generally either nylon or poly (polyethylene) material. Nylon is normally the more expensive option, but that’s because it’s stronger. You will need to check the twine size that’s listed for the netting, and this number is usually #30 for commercial cages. A poly net with a #21 rating may be enough for moderate use, although if you use the cage constantly or if you’re a hard hitter then a stronger netting of even #40 poly may be needed. In general, it’s more cost-effective to get thin nylon netting than thick poly netting. A #40 poly net matches the strength and durability of #20 nylon. Don’t forget to check for UV protection. Without this, netting can dry out and just eventually disintegrate. This is the protection for the pitcher, which allows thrown balls while it protects the head and body of the pitcher. The frame and netting are both the same as for the hitter. This is a standard part of the package for many home batting cages. Usually this is listed in LWH, or length, width, and height. Since baseball is an American game, the measurements are also regularly in feet. If you want to pretend you’re in the majors, you’ll want one that’s about 70 feet long. The distance between the back of the home plate and the center of the pitcher’s mound is 59 feet, and the extra space allows for some freedom of movement for the pitcher and for the hitter. This may not be included in a standard package, nut it’s a nice bonus. These kits are used to secure the batting cages against strong winds. The kit includes wires, stakes, and metal latching devices called “carabiners“. Hopefully you can set this all up with your teammates without too much trouble. YouTube can be a great help, but the manual instructions should be clear, needed tools should be part of the package, the website should have some informative videos, and the customer support should be available. Let’s now take a very close look at some of the more popular options in the at home batting cage niche. 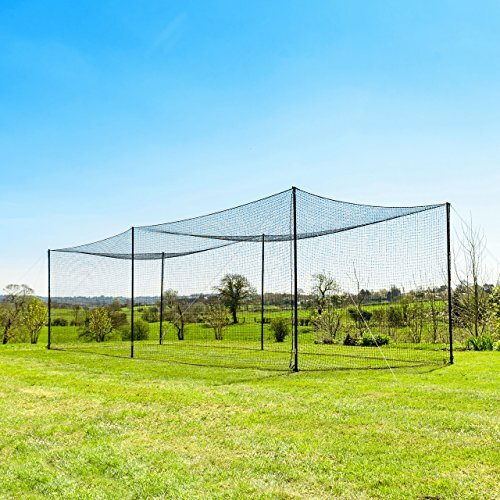 The Best Batting Cage Available On The Market! The Fortress brand is quite popular among those who need batting cages for home use. This “Ultimate” model is a good example of why. Firstly, you already have everything you need in the package, and that includes the poles. You get the built-in tie cords, the extra central roof salvage, the 1-piece netting with the roof and 4 sides already sewn together, and the heavy-duty 3.8-inch overlocked knotted border rope along the horizontal and vertical edges. You also have several options as to the size, and it can be as short as 20 feet long (costing about $350 or including shipping) or as long as 70 feet (for $750, although some retailers may insist on $1,500). In all instances, they’re 10 feet wide and 9 feet high. So even if you like to raise your bat high, you have ample space around you. The uprights are made with heavy-duty steel. They aren’t really completely straight and that’s a good thing as it demonstrates that it can offer some give. It uses #42 poly twine, with 1.75-inch square hung mesh. It is completely weatherproof, UV-protected, and rot-proof too. This is so tough that you can expect many years of use even if it helps entire teams practice their batting constantly. The only issue here is the assembly, as you may not get a setup manual (although others do get their manual). If you do get the manual, you’ll find that the instructions are quite easy to understand. With a few people to help and a ladder, it shouldn’t take you more than an hour to complete. 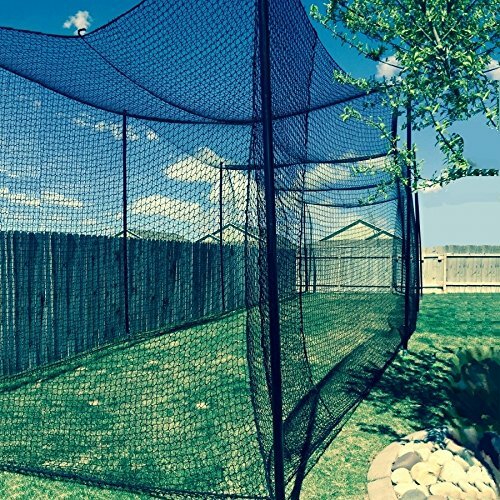 See the deal on this Fortress home batting cage on Amazon here. We checked out the Gourock package, which does not come with the frames so the price and cost of shipping are much more affordable. Your total expenses for this thing may come to less than $300, although you will still need to set aside some other money for the frame. It uses #34 poly netting, although its look and texture looks a lot like nylon. The mesh squares also measure 1.75 inches. It features Raschel knotless mesh construction. It’s 40 feet long, 10 feet wide, and 10 feet high. At various points, you also have overlock-stitched sewn HDPE rope borders. They measure 3/8 of an inch. There are 6-inch installation loops at the corners, and an entrance door. The netting comes with 4 units of UB stabilizer. You can install this with a freestanding frame, within vertical poles, or just with cable suspension. It can even be used indoors if you have the space. Just make sure that the support you get can handle the 32-pound weight. This is strictly a netting package, so clips and poles are extra purchases. It is quite durable, however, and many customers say that it works as advertised. However, you really need to take care of the support. A bouncy set of poles for the frame may negate its many benefits. This one is small, but quite versatile. Aside from the affordable price, both daddy and kids can use it for various sports. It measures just 24 feet. That may make it more useful for smaller yards. But it gives lots of space around you as it is 12 feet wide and 12 feet high. It doesn’t have the baseball hitting screen, whoever, so you may need a pitching machine. It doesn’t give the strength rating of the netting, but it’s fairly safe to say that it’s strong. That’s because it’s even designed for practicing your golf swings. The netting also offers 1-inch poly mesh. 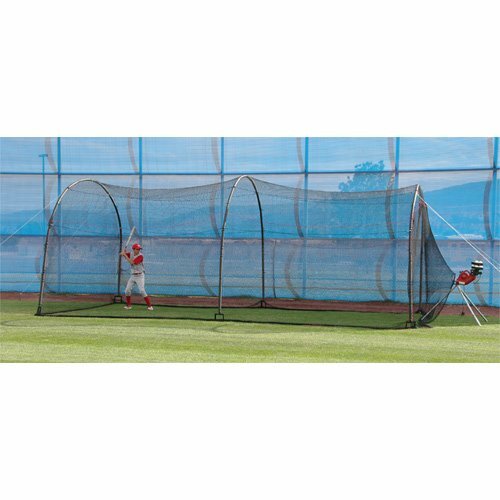 It comes with fiberglass frame poles that curve on the roof, padding around the poles, a built-in harness for the pitching machine, steel ground stakes, and nylon support ripe. But you may have to buy and use Velcro straps to secure the draping of the netting over the frame. Don’t forget to read the other reviews on these home batting cages. But, for the most part, they’re all superb. They’ll let you get all the practice you need so you can improve your hitting and help your team win. Jeff …we are Very Lucky to have indoor cages near by.They have great nets..Turf …& even a batting machine to use for $10./hr. A great benefit for us.We have a Turnament this coming weekend. Glad to hear how great your daughter did this pat weekend! ! She’s Very lucky to have a Great Mentor like yourself! !